Jared Leto knows a thing or two about filmmaking, and he's putting it all to good use in promoting This Is War, the upcoming album from his band Thirty Seconds To Mars. Teaser clips (featured below) are already appearing on YouTube. Apparently, each video contains a code that unlocks a piece of the jigsaw at thisiswarrevealed.com. When the jigsaw is complete, there will be a free download for all participants. Sounds simple enough, right? Ahh, but how many videos will there be in all? So far, Leto isn't saying. 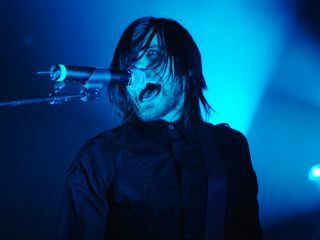 What he is doing, however, along with bandmates Shannon Leto and Tomo Milisevic, is talking up This Is War, the follow-up to the group's 2007 platinum release, A Beautiful Lie. The new disc is produced by Flood, Steve Lillywhite and Thirty Seconds To Mars, and judging from this exclusive video, Jared is still pinching himself to have worked with such illustrious record makers. You can watch the video either in Windows Media or Quicktime. In addition, the band has issued a brief look at the video of the first single from This Is War entitled Kings & Queens. Good luck solving the mystery. Frankly, we're stumped. Guess that's part of the plan.